The luxury destination club BelleHavens has just announced a partnership with Stein Hotels and Resorts Group. Termed the "European Getaways portfolio" it lets BelleHavens members use the Stein Hotels just like any other club property. 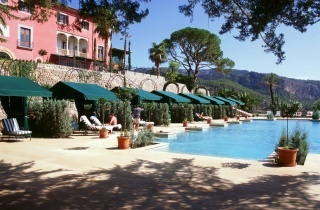 Stein Hotels are small luxury lifestyle hotels with 25 to 125-rooms. Located in eleven European destinations across seven countries, they include a 19th-century school, a historic 16th century monastery and a fully restored 15th-century mansion. Steins philosophy is to provide "the very best elements of Mediterranean lifestyle with the conveniences of today's modern world." 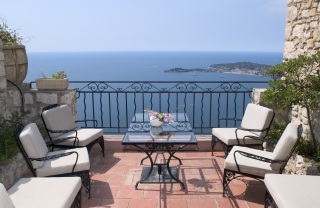 The hotels are located in London (4), Paris (2), Provence (1), French Riviera (1 pictured right), Mallorca (2 pictured below), Tuscany (1), Amalfi Coast (1), Maratea (1), Amsterdam (1), Dublin (1), and Monaco (1). The nightly hotel charges are covered by the clubs annual membership fees and members have a dedicated concierge just as they do at all club properties. Members also have access to the best rooms and suites at each location and can reserve more than one room. While this is a good way for the club to provide members with stunning and unique accommodation in Europe, it is also a divergence from the "traditional" destination club model. Destination clubs mainly provide large, luxury, family homes where members can bring their (extended) family and friends, and can be the host in a comfortable, private, family home atmosphere. Offering hotel style accommodation provides a different setting and atmosphere. The partnership does allow BelleHavens to quickly provide members with luxurious accommodation in Europe, something that the members clearly want. BelleHavens recently announced that it plans to acquire some homes in London, Paris and Italy. So this is also a good way for the club to assess which other destinations in Europe are popular with its members. In addition the destination clubs also have a duty to safeguard their members deposits. They do this by ensuring that a large proportion (usually 80%+) of the deposit goes into buying and furnishing the clubs homes. A club can diverge a little from this model, and so partner with a hotel company to provide accommodation, but it does mean that the club is using money to pay for hotels and not using the money to pay for club owned homes. In BelleHavens case, this partnership is a "usage rights bond" which gives BelleHavens 365 days a year of hotel rooms in exchange for a loan equivalent to the cost of one of their homes. Overall an interesting model, which provides members with immediate access to those highly sought after European destinations and protects their capital. In the short term and on a small scale this should work pretty well for the club and its members but clubs ultimately needs to have their own homes in Europe if this is where their members want to go.